Thanks to filmteam „Gratwanderung“ for filming and video editing. New album „Mortar“ will be out on VINYL and Digital Download on July 7 via FDA Records. It’s back with a new videoclip! Today it’s official! 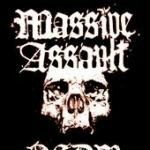 Massive Assaults ‚Mortar‘ album is out now on 12″ vinyl!